Many Final Cut projects can be mixed directly in Final Cut, especially using the new audio mixer that appeared in version 4. However, projects with more complex audio demands are more easily mixed using audio software like ProTools, Logic or Deck. As I am a big ProTools fan, this technique describes what you need to know to move audio out of, then back into, Final Cut Pro. 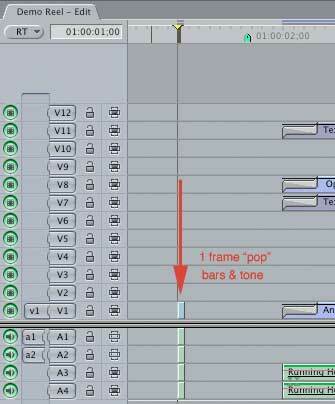 2) Add a 1 frame "pop" of audio exactly 2 seconds BEFORE start of first picture on all audio tracks to act as a sync point "just in case"
3) Add a 1 frame "pop" of audio exactly 2 seconds AFTER end of last picture on all audio tracks to act as a sync point "just in case"
7) Don't export audio until you've locked picture. Once you have locked picture, that is, you are sure your video timings won't change, you are ready to export your audio. AIFFs can be read by any audio editing package. OMFs, which are far more flexible, are generally only readable by audio workstation software; for instance, DigiDesign's ProTools (if you are using ProTools LE you'll also need to purchase the DV Toolkit option ), Bias' Deck, or Apple's Logic. The benefit to using OMF files is that all clips remain individual clips, so you can move them between tracks, each with separate volume and pan controls, as well as adjusting their in and out points and adding customized fades. When you export an AIF, all clips on a track get consolidated into one large clip. Export all your audio into separate audio pair files, then combine them in your audio editing application. 3) Name the export file (i.e. "Tracks"). 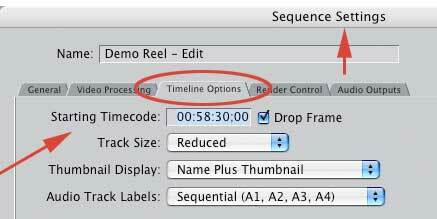 QuickTime will automatically append the actual track numbers to the end of the file name. 7) Make sure the one frame audio pop exactly lines up vertically between all tracks. 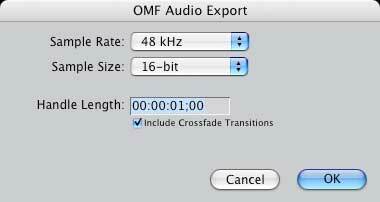 4) Open the OMF audio file in your editing application. Note that OMF files contain all the audio from your selected sequence, so the files can get fairly large. (There is a 2 GB limit on OMF files, so, if you are doing lots of tracks for a long program, you'll probably want to break you sequences up into individual acts for mixing. 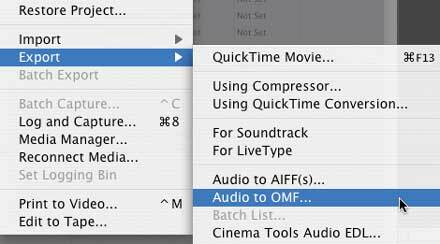 Regardless of whether you are exporting as AIF or OMF, you'll need to get your finished audio back to Final Cut. When you are ready, export your final mix as a stereo AIF file. Then, inside Final Cut, import that final AIF mix into your Browser. 2) Line up the audio pop just before start of picture on the new mix with the pops that you put into your original audio tracks. I've never had sync drift when I kept files fully digital. However, you can reassure yourself by checking the audio pops at the tail of the project and make sure they still line up. 3) Once everything is sync'd, turn off the visibility of all audio layers EXCEPT your mix and you are ready to output. This article is from the March 04 issue of "Larry's FCP Newsletter," a FREE, very cool, monthly Final Cut Pro newsletter -- click here to subscribe. Or, visit his website at: www.larryjordan.biz.